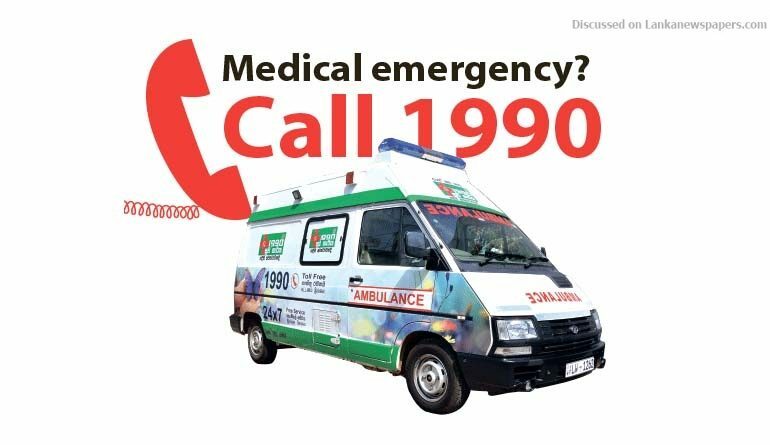 The ’1990′ pre-hospital care-free ambulance service will get a boost shortly with the introduction of legislation to expand the service to cover the whole island and ensure the smooth operation of the service in a sustainable manner. The service which was started in July, 2016 with a grant from the Government of India has responded to thousands of emergency calls in the Western and Southern Provinces where the service currently operates. The new Bill will provide for the establishment of the 1990 Suwaseriya Foundation with the objective of providing pre-hospital care ambulance services and emergency response services in addition to providing immediate and effective pre-hospital care-free of charge in a safe and clinical working environment until a person reaches the nearest healthcare provider. The administration and management of the affairs of the Foundation will be vested in a Board of Management which will have as its ex-officio members, the Secretary to the Ministry of Finance, Secretary to the Ministry of Health, the Inspector General of Police or one of their representatives and four members appointed by the President. The four appointed members will be persons who possess academic or professional qualifications and have experience in medical science, pharmaceuticals, medical technology, finance, management, administration, or law. The Board will be empowered to appoint to the staff of the Foundation a Chief Executive Officer and employ or appoint such employees as may be necessary for the efficient exercise and discharge of its powers, functions and duties. Once the new law is enacted, funds lying to the credit of GVK EMRI Lanka (Private) Limited which now operates the free ambulance service as well as all movable and immovable property of the GEL including the ambulances and medical equipment purchased under the Indian grant maintained by the Ministry of Health will be vested with the new Foundation. All its current employees too will be transferred to the new Foundation. The 1990 Suwaseriya Foundation Bill will be presented to Parliament by Prime Minister Ranil Wickremesinghe in his capacity as the Minister of National Policies and Economic Affairs.